I think I saw that, I remember Robertson & Duval but not much else, "The Long Riders" I have already on DVD, I'll have to check it out. Saw it at the theater while in high school so long ago. Thought it was dull at the time, but seemed realistic to me then. This film came out during that beginning of the decline period in Western films where the trend was to make comedies, this seems to lean more towards a comedy. Its got some great vignettes, some work some don't, about the "wonderments" (as Cole Younger calls them) of the industrial age and the comming of the modern world (a baseball game which goes on too long). Its entertaining but its nowhere near the actual story of the James-Younger ganges disasterous raid on Northfield, Minnesota in 1876. In this film Cole Younger is the leader of the gang, Jesse a sort of religious nut, and Frank comes off somewhat feeble minded. Its got some wild plot points that are far from the historical record. It does have great sets however and Northfield the city is a wonderment (actually Jacksonville, Oregon) it looks spot on believeable. Contrast this with Walter Hill's "The Long Riders" which is classically stylistic and a far far better film. I like this film a lot. Very Altman-like (would make a good double-bill with Buffalo Bill and the Indians). Funny, with occasional touches of ultra-violence. Dave check out "The Long Riders" if you haven't yet. I saw it on its original run, but I'm gonna give it another look as soon as my copy of the DVD arrives. Robertson as Cole worked for me, but Duvall as Jesse James just didn't work. I liked the supporting cast, but overall I just couldn't get into the film. There was enough there I'd probably give it another try. I do love how Robertson's tinkering with the musical instrument on the street ends up playing a huge role in the robbery...and not in a good way. Good review, but I question sometimes whether they go back and read/edit what they wrote. It mentions Luke Askew as a brother-in-arm, and then later in the paragraph tells about Askew's character like it's somebody else. The Great Northfield Minnesota Raid (1972) is a "revisionist" take on Jesse James and Co. that just doesn't work. It's a remarkably odd and disjointed film that is inconsistent in tone and pace, and ruins a potentially great story with goofy irreverence. The Missouri State Legislature is about to issue a pardon of Jesse James (Robert Duvall), Cole Younger (Cliff Robertson) and the rest of their gang, but the conniving of the Pinkerton detective agency scrubs that idea. Jesse and Cole then decide to launch one more job: robbing the huge bank at Northfield, Minnesota, "the largest bank west of the Mississippi." Cole and Jesse infiltrate the town, and even get the greedy banker (Robert H. Harris) to help them by convincing townspeople to deposit money in the bank. The robbery itself goes off horribly wrong, and the James-Younger gang splinters as a trigger-happy posse pursues them across Minnesota. For Philip Kaufman (The Right Stuff), making a "revisionist" Western means being irreverent, goofy and silly, while missing anything resembling a point. In this regard it's closer to nonsense like Butch Cassidy and the Sundance Kid and The Life and Times of Judge Roy Bean than The Wild Bunch: for all the detail and gritty violence, it's really just empty, self-deprecating fluff. The film has its moments but adds up to very little; it seems too impressed with its own "cleverness" to work as a Western, and never seems able to settle on a tone. Kaufman rehashes the old James legend with little criticism, with one interesting frill: Cole is the brains of the gang, while Jesse is a psychopath who thinks he's still fighting the Civil War. His depiction of Northfield as a den of capitalist depravity is very much of its time, its scheming bankers swindling the dopish townspeople out of money, and inadvertently assisting the soon-to-be bank robbers. The movie lays the Robin Hood schtick on thick, with Jesse killing Yankee soldiers and an abusive landowner, and the Snidley Whiplash-type Pinkertons, but showing Jesse as a murderous nut rather kills the message. But this is only part of the problem. The film has a broadly comic edge which works only fitfully; the humor is cartoonish and silly, with a distinct absence of wit. A lengthy baseball interlude goes on way too long, albeit with a funny pay-off. We get endless scenes of the greedy, gormless and gullible townspeople swindling or being swindled, and haphazardly tracking down the gang, hanging a few innocent men for being at the wrong brothel. Cole spends a lot of time marvelling over "wonderments" of modern technology: a running gag with a calliope has a nice, plot-appropriate payoff, but otherwise it's an obvious message impressed upon us once too often. There's certainly the potential for laughs but it falls flat: the bleak amorality is ill-served by Keystone Kops goofiness and Kaufman's sophomoric script. Kaufman's direction is another problem. For all the rich period detail and the occasional stylish moment, the direction is bland and uninteresting. The pacing is awkward, the narrative disjointed, and Bruce Surtees manages only a handful of nice shots. Even the shootouts are poorly staged, with the titular robbery a bland anti-climax. At least The Long Riders, for all its faults, had some well-staged action scenes. Cliff Robertson is solid, and his thoughtful, subdued portrait of Cole is arguably the film's highlight. Robert Duvall is ridiculously hammy, chewing scenery like a starved Lionel Barrymore. The supporting cast is generally good, with Luke Askew (Pat Garrett and Billy the Kid), R.G. 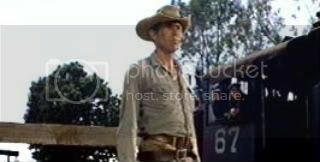 Armstrong (Ride the High Country) and Matt Clark (Jeremiah Johnson) playing Jesse and Cole's cohorts, and Donald Moffat, Royal Dano (Man of the West), and Elisha Cook Jr. (Shane) as various townspeople. The Great Northfield Minnesota Raid is a bitter disappointment. Perhaps those with more tolerance for oddball goofiness in Westerns would enjoy it more; God knows I've been the minority opinion many times before. Still, it has little of value to offer - not thematic material or interesting violence or humor that's actually funny - and proves an unfortunately poor entry in the Western genre. The best Jesse James movie and it's more about Cole Younger. I think it's the best movie on the subject ( the biggest blunder of the James/Younger gang's career ). Despite the historical inaccuracies it feels very authentic. It looks, feels and even tastes like you're there. Some people on IMDB think the baseball sequence slows the picture down but I think it just adds to its authenticity. This movie is 100x better than the similar in subject Long Riders. LR is nothing more than footnotes in the James/Younger history put together to make some sort of followable sequence. Sure it has a nifty gunfight/massacre at the climax but that's all it has going for it. That and its stunt casting. Yeah but this movie has nothing going for it. Well, maybe Cliff Robertson. As usual the Tin-Eared One ignores the film's obvious musical asset, the calliope. It doesn't take Tin Ears to detect a plot device.